My daughter Sam spent the night with me in my beachfront condo at the Surf Club in Montauk. In the morning we headed downtown to Mr. John’s Pancake House. It had quite the unusual menu and after some time we decided on an order of ET Pancakes and Stuffed French Toast. I’ve always been much more of a sweet breakfast eater than a meat one, and this one more than satisfied my sweet tooth. 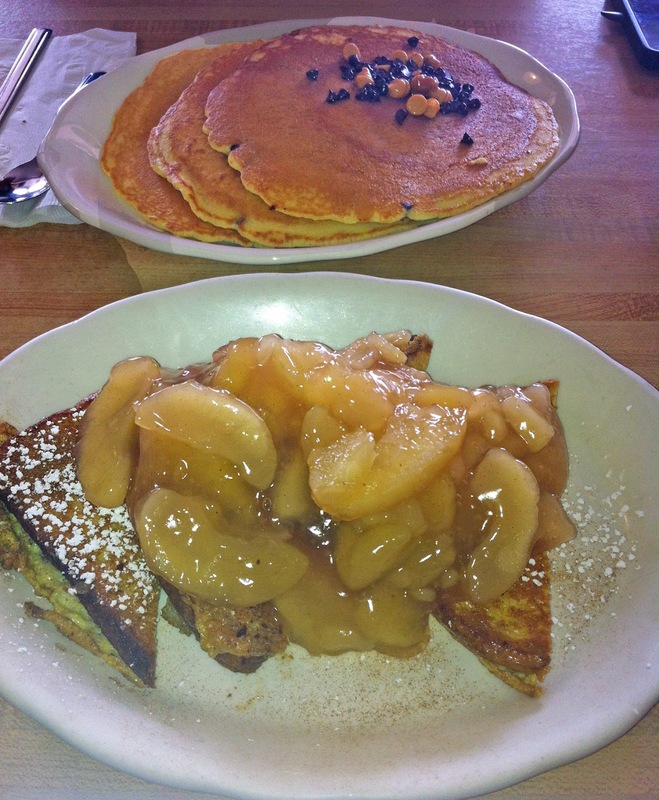 The pancakes were covered in semi-sweet and peanut butter chips and the French Toast was stuffed with cream cheese and covered in apples (a bit rich, but yummy). I knew I would have to add in another workout to make up for this. Sam had to get to work, but I took my time enjoying the scenery in Montauk and the Hamptons as I headed west to meet up with my friend Melanie. I knew I had another big meal ahead of me so I kept lunch down to a fat free yogurt. Dinner was at a place I had never been to, but had heard lots of good things about. Left Coast Kitchen in Merrick is as known for their cocktails as their food and is the brainchild of two food and drink lovers, Chris and Heather Randell. I was immediately impressed with the menus for both. We started with some cocktails, a Pear Millionaire (Grey Goose Vodka, pear simple syrup and St. Germain) and a Morning Wood (Stoli Vanilla Vodka, Kahlua, Frangelico, Bailey’s Irish Cream and Van Gogh Espresso Vodka). 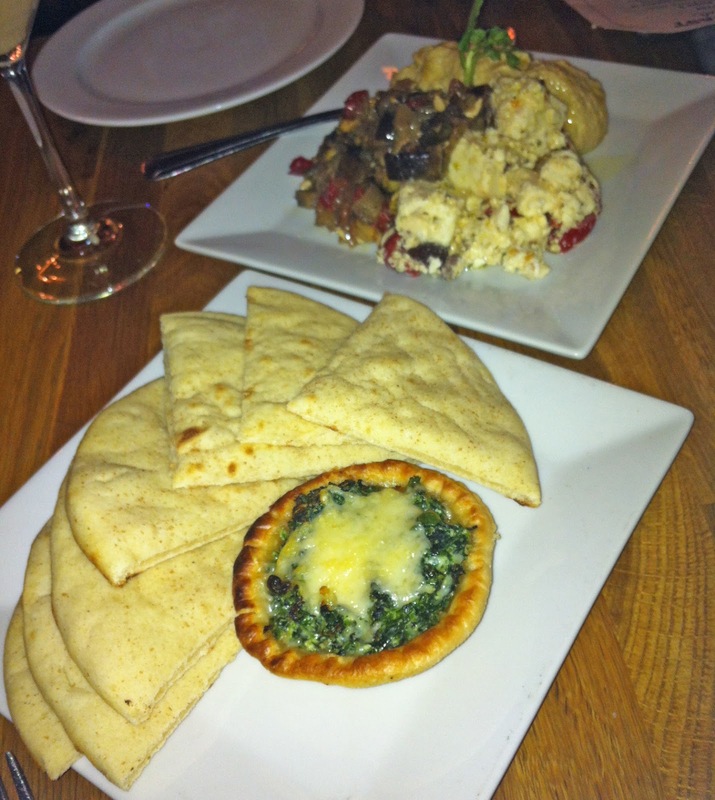 They were both great, but loaded with alcohol, so we immediately ordered a Mediterranean Nosh to nibble on while we looked over the menu. It was a perfect combination of some of my favorites – hummus, olive-feta salad, spinach pie, warm pita. The menu was filled with so many offerings it was hard to know where to start. I always go vegetarian when given the opportunity for creative options and that is definitely the case here. 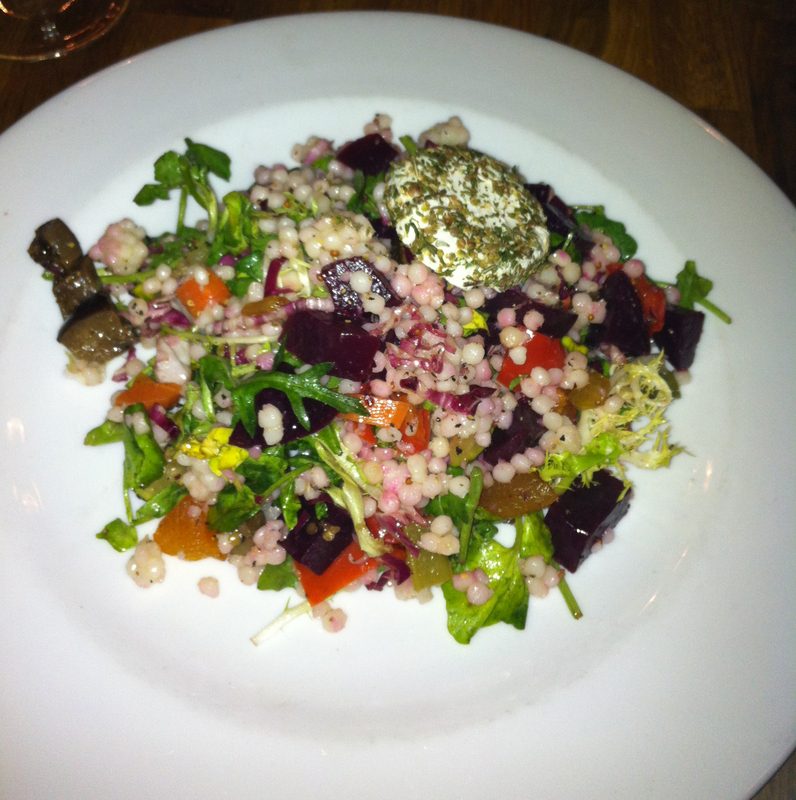 I started with Chopped Bliss (red beets, garden veggies, sun dried fruits, cous cous and goat cheese in sherry vinaigrette). It was so fresh and flavorful I could imagine this as a perfect lunch in itself. My main dish ravioli was also vegetable filled and though it was tasty, I wasn’t sure about the addition of corn. 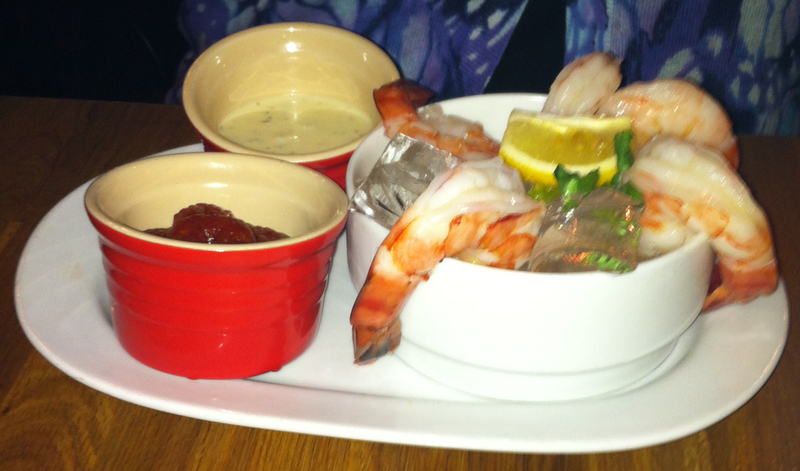 Melanie had the Colossal Shrimp Cocktail with 2 Alarm Cocktail Sauce and sweet lemon aioli. She said it was delicious, as was her Sesame Crusted Yellow fin Tuna, roasted over Forbidden Risotto Morimoto and served with a sweet and sour asparagus stir fry in a wasabi dressing. The menu also offered a number of meat options (such as Root Beer Glazed Pork Chops) customers were enjoying. 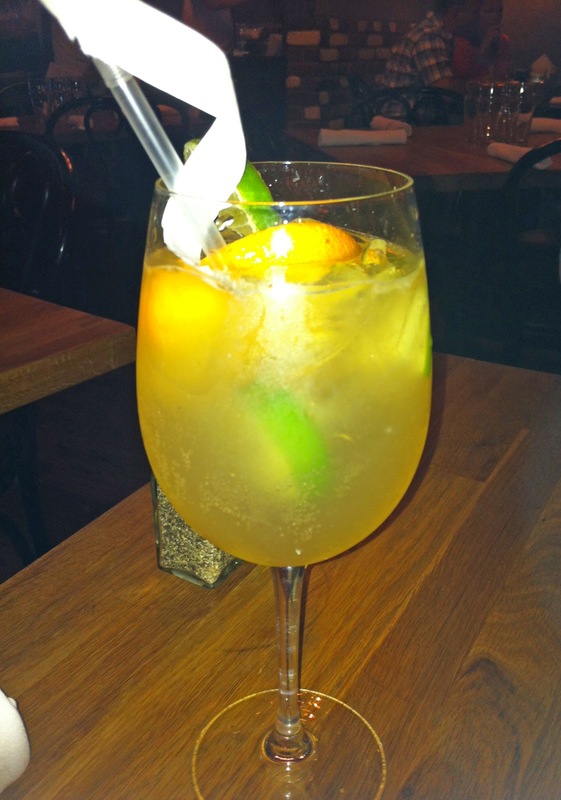 Left Coast Kitchen has an extensive wine menu, but with dinner we tried the New Age Cocktail. It’s basically a combination of sangria and a wine spritzer, made with an Argentinian white (they don’t indicate which one, just that it’s No. 1 in Argentina). 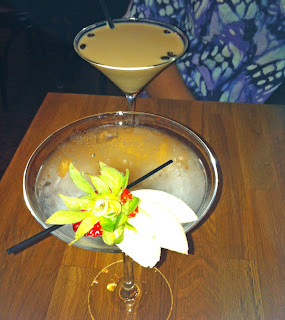 It was quite fruity and one of those dangerous drinks that you keep guzzling down without realizing how many you’ve had. Deciding which dessert to have was easy as Left Coast Kitchen offers the Tower of Power, which basically translates into one of every childhood favorite you’ve ever had. Despite the explanation from the waitress, I didn’t quite believe what arrived at our table. 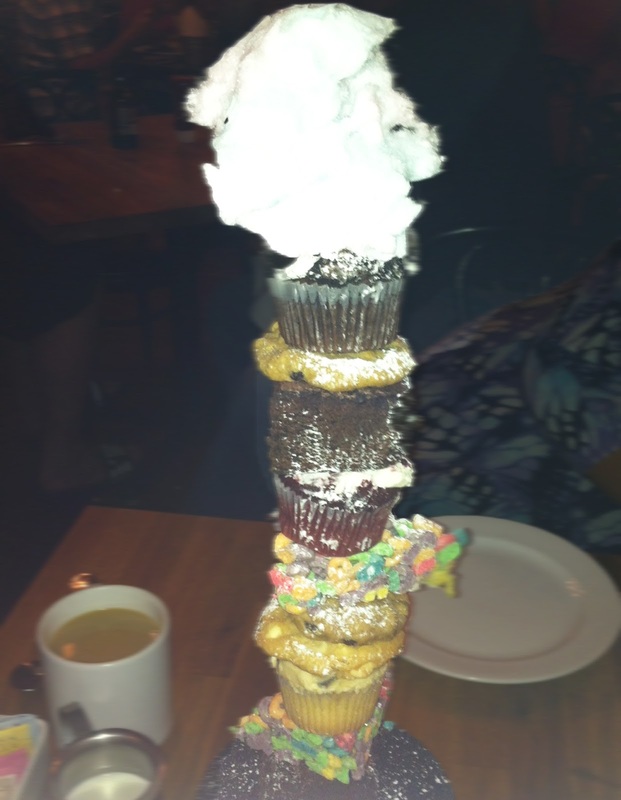 It was indeed a tower – with layers and layers of treats! The “tower” included brownies, Fruit Loop cereal bars, yellow cupcakes, white chocolate macadamia cookies, oatmeal raisin cookies, red velvet cupcakes, chocolate chip cookies and Oreo cupcakes. It was topped with cotton candy. Needless to say, we didn’t make a dent in it, but did get quite an audience trying to see how much of it we would eat. Finally, after we had sampled a bit of everything, Melanie decided to take the balance home to bring to her coworkers. Another fun-filled trip to New York came to an end and I was heading back to the Midwest to get ready for my next Chicago adventure.